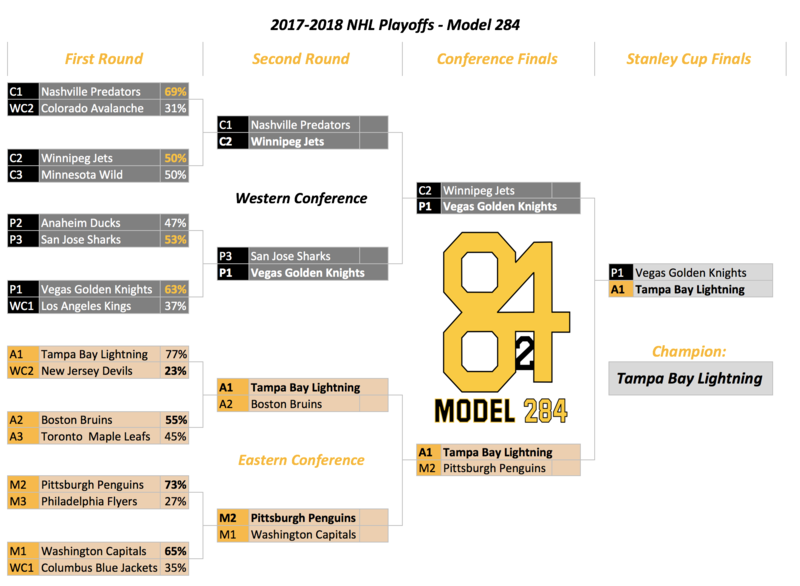 Below is our Model 284 consensus bracket for the 2017-18 NHL Playoffs as well as some Model Factoids. As you will see from our first round Predictions and playoff simulation results, we do not necessarily pick the model’s predicted winner for every single game, but use all available information (e.g. injuries, areas model might be lacking, etc.) to make the best prediction on each series. The President Trophy winning and reigning Stanley Cup runner Nashville Predators might exit the 2017-18 NHL Playoffs earlier than expected. The Minnesota Wild are known for Defense. Without Defensemen Ryan Suter and a likely still hampered Jared Spurgeon, the Wild defense will take a significant hit; thus, the Model probably overestimates the Wild’s abilities. If the Los Angeles Kings upset the Vegas Golden Knights, they are a good bet among wild card teams to make a deep run. Otherwise, we may see a couple Stanley Cup Finals games in the great state of Nevada. It’s not the Caps year! The Penguins seem destined to beat the Capitals yet again. The cup might be struck by Lightning this year. The NHL playoffs are hard to predict.